Immerse yourself in a thrilling Egyptian adventure in the city of Luxor, surrounded by temples and tombs including the Valley of the Kings and the Valley of the Queens. 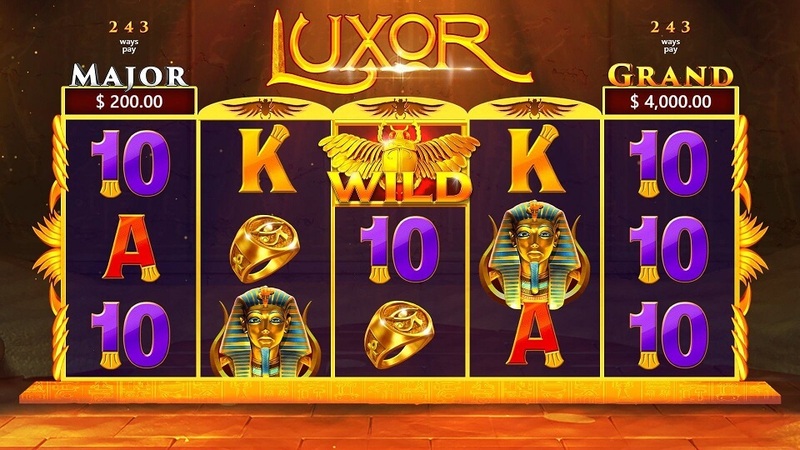 Luxor is rich both in legends and antiquities, and now is your chance to step back in time with this visually stunning video slot and discover the ancient treasures hidden in this great city. Luxor slot will take you on a journey like never before, filled with free spins, bonus rounds, expanding reels and more exciting features. The expanding reels and the WILD symbols are key in-game elements that boost the players’ winnings. Triggered by 3 bonus symbols on any reel, the Pharaoh’s Tomb Bonus game will begin, giving the opportunity to win additional free spins or instant jackpot wins! No need to ask your mummy, simply grab your treasure hunting gear and get ready for your quest towards great wins! Winning ways are the possible patterns of symbols that result in a winning combination. In this game, there are between 243 and 1944 possible winning combinations depending on whether the reels are expanded or not. Every 3 or more adjacent identical symbols generate a winning combination. Winning combinations are counted from left-to-right. *Free Spins - triggered by matching 3 matching Free Spins symbols or 2 matching Free Spins symbols and a '+5 Free Spins' symbol in the Pharaoh's Tomb bonus game. Triggered by a WILD symbol on reel #2, #3 or #4. When a WILD symbol appears on one of those reels, the reel itself expands upwards to create an additional space for an extra symbol, and the player is rewarded 1 re-spin with the new layout. If another WILD symbol appears during the re-spin additional expanding happens (up to 6 symbols in total per reel) and the expanded reels do not contract until the player is out of re-spins. A WILD may appear in more than 1 reel per round, resulting in 2 or even 3 reels expanding upwards at the same time. If two or more WILD symbols appear in a single round, the player is still rewarded with only 1 re-spin. *The bet amount cannot be changed once a re-spin is rewarded. The Pharaoh’s Tomb bonus game is triggered when 3 Tutankhamun Mask symbols appear on reels #2, #3 and #4. 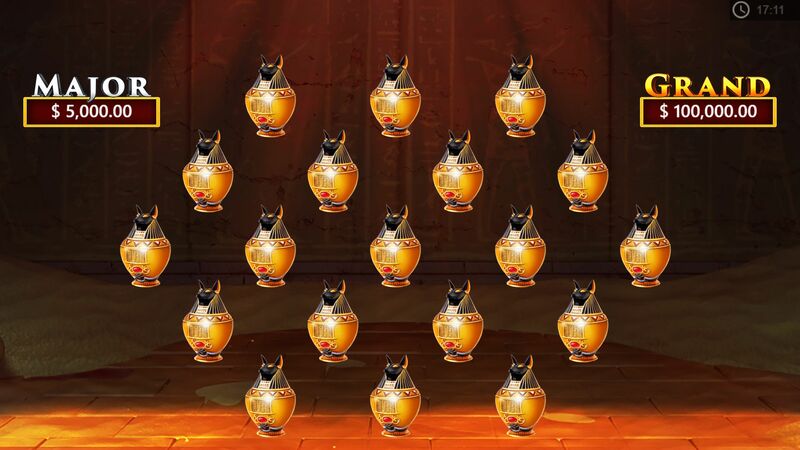 The player enters the Tomb of Tutankhamun and is presented with 19 lucky Urns– each urn holds one special symbol. The player must choose urns one-by-one until 3 symbols match. As soon as 3 symbols match, the Pharaoh’s Tomb bonus game ends and the player collects their reward i.e. a jackpot amount or their awarded Free Spins begin. Free spins are triggered if 3 matching Free Spins symbols are chosen within the Pharaoh’s Tomb bonus game. The Free Spins can also be triggered with any combination of 2 matching Free Spins symbols and a ‘+5 Free Spins’ symbol, i.e. the ‘+5 Free Spins’ symbol can substitute for any other Free Spins symbol. A combination with the ‘+5 Free Spins’ symbol awards an extra 5 Free Spins, resulting in 15 Free Spins. 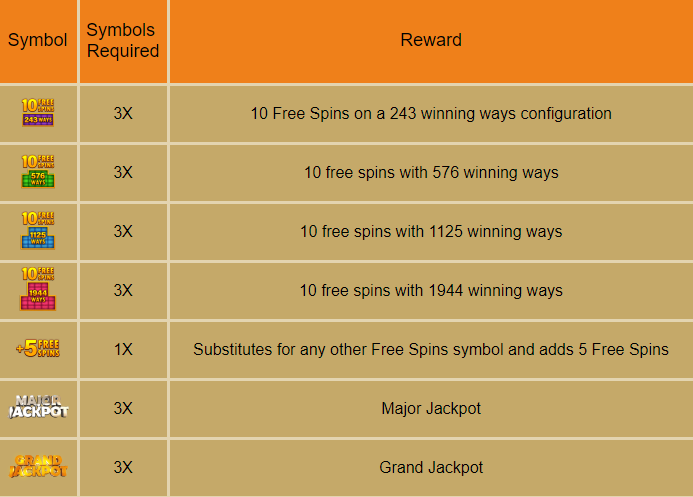 If the Free Spins symbols selected are from more than 1 category (e.g. 243 ways and 1125 ways), and a ‘+5 Free Spins’ symbol are chosen, then 15 Free Spins are awarded based on the highest pair of ‘winning ways’ symbols. You will be awarded, 15 Free Spins on a 1125 winning ways configuration. 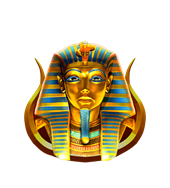 During Free Spins, if 3 or more “Tutankhamun Mask” symbols appear anywhere on the reels the same initial amount of Free Spins is awarded to the player. Free Spins can be retriggered up to 9 times, rewarding the player with up to 100 or 150 Free Spins at once depending on the initial amount of Free Spins won by the player. Stacks of up to 4 Wild symbols on one reel might appear during Free Spins. While in Free Spins, the reels cannot be additionally expanded by Wilds and they always keep the setup predefined by the Pharaoh’s Tomb bonus game. 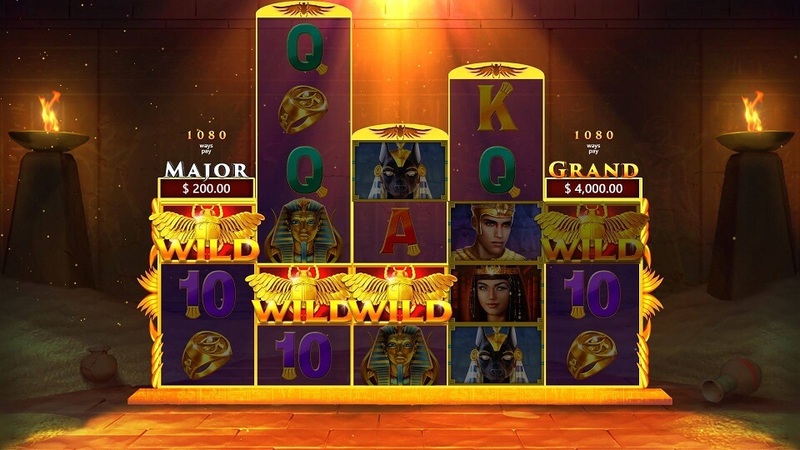 Major Jackpot is an instant win feature that is triggered by matching 3 Major Jackpot symbols in the Pharaoh’s Tomb Bonus game. The player instantly wins their bet amount x100. The default winning combinations are determined according to a 243 ways pattern, and up to 1944 ways when the reels are expanded. The ways represent the positions on each reel multiplied by the adjacent reel 3x3x3x3x3 in default state and up to 3x6x6x6x3 while reels are expanded. Every 3 or more adjacent identical symbols generate a winning combination. Winning combinations are possible only from left-to-right. All symbol multipliers can be found in the Symbol screen in the Info pages. The prizes are calculated using the following formula: Bet amount, multiplied by the symbol multiplier, divided by 50. Simultaneous wins on different ways are added together. Free Spins are played at the same bet amount as the round that activated the Bonus game that led to the Free Spins. Free Spins wins are added to any initial wins. At the end of the Free Spins, the game returns to the round that activated the Bonus game. Continue – You will return to the game being played. Go to account – You will be redirected to your user account on the host website. In desktop mode, your account will open in a new window\tab. On mobile, the game screen will change to your account and will exit the game. Quit game – This will exit the game and return you to the games lobby.